Palm Sunday is this weekend, April 13, 2014. On this day we remember Jesus’ Triumphal Entry into Jerusalem. It is is the beginning of our Holy Week observance. Click Here for our Holy Week Schedule. Worship begins on Palm Sunday at 9:00 a.m. We look forward to seeing you at worship on Palm Sunday, and/or during Holy Week. 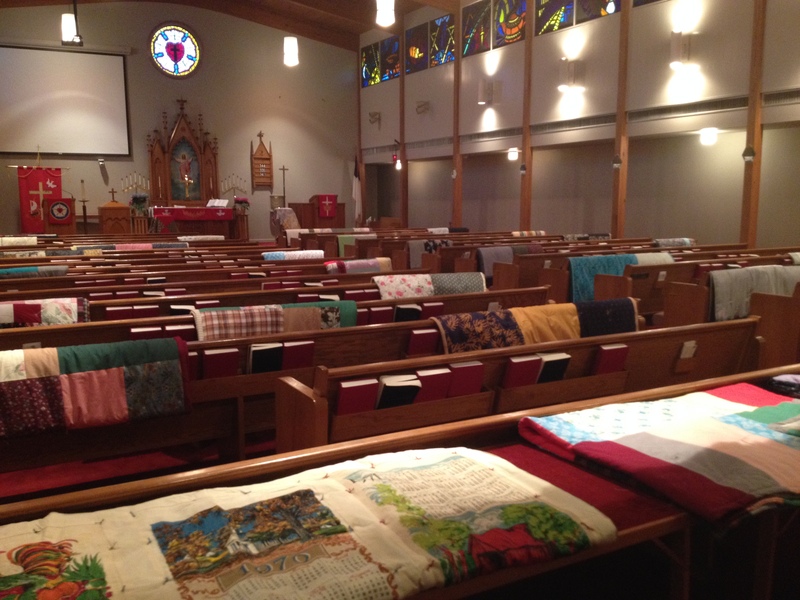 On Palm Sunday every year we dedicate the quilts which have been made during the past year. The photo above shows the abundant production of quilts for this past year. These are ready for dedication in our sanctuary on Sunday morning. We will also dedicated baby care kits, school kits and personal health kits at this worship service. Click on this link to see a previous post about the preparation for this special Sunday.